, we can begin creating our experiment. You should be able to see your experiment overview page by logging into your AdWords account, clicking the Campaign Management Tab, then Tools, then Website Optimiser, then your first test setup in Part 4. You will want to add a couple of variations to each section. The sections are defined by the small bit of code you installed in part 4 under Page Sections. You will see that each section name you placed in the code appears as the heading in the left hand column. You will be able to view the original and add new variation. You should also see a preview link which opens in a new window. This shows you the changes you have made and how they look. If you're unsure of what you should test you might find this article from Conversion University helpful. After you click Add new variation you will be asked to enter a name for this variation. You're limited to 25 characters, so keep it simple and short. This information is only used to help you identify which parts of which pages are working the best for you. We called ours "Give Today! ", because our new headline is "Give Thousands Hope Today!" This however is just one variation of heading. You can literally try as many as you want. However since this is one of your first experiments we recommend to sticking with 2-3 variations. Once you are happy with the variations you have created, click on the preview link to check the various combinations of the page that you have created. You can see in the example below, that the headline is changed for what we placed in our experiment. So you are happy with the experiment and are now ready to continue. Click on the continue button. Be warned however that once an experiment is launched you won't be able to make any more changes. Therefore before launching double check you are happy with it one last time. If you find that you made a mistake you have a few options. The easiest is to simply pause the experiment so only your original page shows. You can also delete individual variations from your experiment. This is called pruning. The final step before launching your experiment is to let Google Website Optimiser know how much traffic you wish to devote to your experiment. If you only wanted to show your experiment to 20% of your traffic, you could select 20% here. In this instance we are going to let all traffic see the original and our variations. So we selected 100%. The more traffic you send to your experiment the sooner you will get clear results on which variations are working better. If you are nervous about making changes to your site, you can set a lower amount of traffic say 10-20% to view your variations. We are just about done. Once your experiment has launched you will be presented with an overview page where you can see the status of your experiment. Keep in mind that Website Optimiser won't show reports until a few hours have passed. Congratulations, you've launched your first experiment. We hope Google Website Optimiser brings you and your organization more success! Our last part in the series will cover interpreting your experiment results and how you can continue to use testing to improve your site. Now that we have installed and validated our Google Website Optimiser code, we can begin creating our experiment. How do I improve my ad's performance? Let your ad text tell the story of why your website is relevant to the people searching on these terms, and set the stage appropriately for the page they're about to visit. It's easy to forget that everyone who visits your site lives somewhere, and a local message is often more relevant than a national one. Even if your company caters to an international audience, consider creating new campaigns that speak more directly to specific regions. Creating separate, geographically targeted campaigns narrows your audience, allowing you to write more customized ad text and get better insights into search behavior. For example, you might create a campaign targeting Philadelphia, then run a search query performance report and see that the top search terms for that region differ from the top search terms in other areas. Next, you could modify your ad text to make it more relevant to the most popular searches. If you don't know which regions your visitors are located in, run a geographic performance report in AdWords to see where your visitors are coming from in a particular ad group or campaign. If you want an even deeper set of information, install Google Analytics for more detailed data on the traffic coming to your site from individual countries, regions, or cities. Seasonality: Do you have any products or promotions specific to a particular time of year? Search volume fluctuates for a wide variety of terms depending on the season. Plan ahead so that you can take full advantage of increased interest. Current events: This economic recession is a particularly clear example of a current event that can be useful to keep in mind when adapting ad text. Maybe it's time to rethink your ad text or lower that requested donation amount. Periodically re-read your ads to ensure their message is appropriate. I hope the above tips help you generate more interest in your cause than ever before. Thanks for all you do to make the world a better place! You've probably put a lot of time and effort into building a website that's as useful and comprehensive as possible, with a clear audience in mind. This work will pay off when building your AdWords account! Start by reviewing your site and identifying the pages that you want the most people to visit. These pages should contain enough information so that a new visitor to your site won't be confused or disoriented upon first visit. As a Google Grants volunteer, I recently participated in a project to improve the usability of AdWords by building and managing an AdWords account from a grantee's perspective. I volunteered to take one Google Grants advertiser, Prospect 1. New Orleans, to temporarily act as its Account Manager. To make sure I got an authentic experience, I didn’t use any Google internal tools and only used the publicly available AdWords tools. Day 1. When I first started, I carefully examined the grantee's website to understand the organization's mission and what their targeted audience might be. They were promoting art and events in the New Orleans area, which gave me a place to begin building their account. I created a campaign with a single ad group, a single creative, and a few keywords. It wasn't anything fancy, but let’s see what happens. Day 2. I let the ads run for a day and then checked the results. 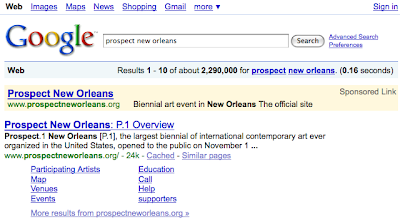 I quickly learned that the keyword “new orleans” drew the most traffic. However it also had the lowest CTR since the keyword was too broad. That significantly brought down my overall CTR, which was in the range of 0.5%. That was clearly not good. I also noticed that my highest CTR keyword was “prospect new orleans”, which made sense because it was a highly targeted term for the organization. However if you search this query, you’ll see that the top search result is also my client’s homepage. So from a Google user’s perspective, my ad was competing with my own site. You might think that’s okay as long as users are coming to my site, either through search results or ads, right? Not always. The key is, there are other popular queries for which your site might not be the top search result, and you need to try to make sure your ad is top ad result even for those queries. So what could I do to improve my chance of being top ad for all possible queries? I tried to promote my ad to be above my search result (as opposed to on the right hand side of my search result) by pausing my highest impression keyword, “new orleans”. Day 3. Things got much better. My ad was now above the search results; my spending was picking up; my daily average CTR jumped from 0.5% to 3%. I then did a few more keyword adjustments, but for the most part, I didn’t change too much. Day 4. I created a new text ad and included the text of “The official site” in my ad. That gave me a much better CTR and my daily CTR continued to rise to 10%. Day 5+. I didn’t make any further changes since my campaign was running like a well-oiled machine. I spent about 15 minutes each day checking performance and pausing those keywords with significantly lower CTR. As a result, my daily CTR continued to rise every day and it got to 30% by the end of the experiment. During the entire course of the time I was optimizing the account, my overall CTR was an unheard of 20%. So through my experience, here are a few strategies I’d suggest if you're looking to improve your account's performance. Please keep in mind that these strategies won't work for everyone, or result in the same performance, but with customization these strategies can be useful for improving your experience with Google AdWords and Google Grants. Tip #1: Iterate often in the beginning. Letting a bad ad run longer means it will take you longer to recover your campaign's performance. Tip #2: Try to beat your own site in search. If your site appears in search result on the left, and at the same time in ads on the right, chances are people will click the search result more often than the ad itself, hurting your overall campaign performance. Tip #3: In the beginning, focus on CTR rather than gaining traffic. Cutting off your popular, but low-CTR keywords in the beginning might help you in the long run. Tip #4: Using a phrase like “official site” in the creative will gain extra eyeballs for you. Hey, check the title of this post. Did I gain your eyeballs? Finally, in case you want to know what happened to this grantee, I have returned its control back to the organization. As I was writing this blog, the ad I created was still the top ad on this page. standard fee structure on March 1, 2009. If you have questions about Checkout or need assistance, please refer to the Google Checkout Merchant Help Center. If you're a Google Grantee currently using Google Checkout, you need to link your Grants account to your Checkout account by 2/15/09 to continue your free donation processing until 2010. If you're a Google Grantee interested in using Google Checkout with your Grants account, you can sign up and get started today. If you're a non-profit but not a Google Grantee and you're interested in Google Grants with Checkout, apply for a Google Grant by March 1, 2009 and if you're accepted, Google Checkout will retroactively credit you for any Checkout fees incurred while your Google Grants application was pending. Sign up for Google Checkout and provide a valid public business website URL along with the other required information. Complete one of the integration options. We hope you continue to find Google Checkout to be the easiest and most cost-effective way to process donations for your organization. Perhaps you've already heard about the changes to the Google Checkout fee structure, but we wanted to bring it to your attention here as well. Google Checkout has been free for non-profits, and will continue to be for all Google Grantees until 2010. However, all non-profits using Checkout who are not Google Grantees will transition to Checkout's standard fee structure on March 1, 2009. Visit our blog for more information on the contest and Website Optimizer. We've been talking about Website Optimizer a lot recently, so we thought we would share a grantee's experience working with the tool, as well as some actual results. Team In Training is the Leukemia & Lymphoma Society's sport training program which helps volunteers raise money to fund leukemia and lymphoma research. Over the summer Team In Training applied and was selected to participate in the Website Workout contest. The contest paired up businesses with consultants who worked to improve the business's website's conversion rates using Website Optimizer. Non-profits: Share your story about Google Docs! To honor the importance of community service during the upcoming Martin Luther King Jr. holiday, the Google Docs team is looking for a few non-profit organizations who'd like to share their stories on the Google Docs blog about how they use Google Docs for their organization. They'll feature a variety of organizations, so get your story out there for the world to see and raise awareness for your organization at the same time! If you're a non-profit that uses Google Docs to manage any part of your organization, from phone trees to collaborative grant writing, check out the Google Docs blog where they're soliciting your participation in a fast-approaching community effort. and introduction to Google Website Optimiser, we will now go through the process of how to install it on a website. The steps you take on your own website may be slightly different. For this reason we have included an example so you can see the process and see how it could apply to your own website. Click on the Create a new experiment link. You will then be asked to choose what kind of experiment you would like to run. For now we will choose Multivariate Experiment because at this stage we do not want to change the entire layout of our pages. We are going to start our first experiment with just minor changes. There isn't much detail on the next page. Its just an overview of the steps involved. Click Go. Now you have three fields to complete. The first is the name of your experiment. We need to give it something really meaningful so that later when we compare it to the other experiments we have run, we can instantly identify it. Useful tip: Give it a name that reflects the desired outcome of the experiment. In this case we have called ours "Increase Donations Test 1". We might decide to run a few more of these tests so numbering or dating them can be useful eg: "2008_11_Increase_Donations_Test_1". Note that the experiment name won't be shown to your website's visitors. Enter the full URL of your test page including the domain name. In our example we have a fictional charity called mycharity.org and the page we want to optimise is the donations page. Remember this is the page we want Google Website Optimiser to make changes to. Next we need to identify our conversion page. In most cases this is a thank you page. If you are not sure what the URL to this page is, you can either go through the process as a test user or ask your webmaster to tell you. If you already use Google Analytics, you might be able to find the conversion / goal page in your Goals settings or Top Content report. The next page is an overview page, giving you advice on some areas with which you may want to test your experiment. Feel free to click Continue when ready. If you choose to have your webmaster set up Google Website Optimiser, skip to step Script Validation. Note: Some websites are dynamically driven (often access information from a database) or may use a content management system (CMS). Website Optimiser will work with these sites, but the implementation procedure will vary from system to system, so you may need to consult your web developer / designer for help installing Website Optimiser. This is the most difficult part of the entire process. After this step, everything else is downhill. The Control Script is a small piece of code that controls how your experiment works. It determines which variation of your page each visitor sees. Right click or command click (for Mac) on the text box area with the code. You should be able to select Copy. You will then want to paste this code into the area of your test webpage. In this case it is the donate.html page. This is how the code looks installed on our test page, "donate.html". In order to measure the performance of your different variations, you will also need to place the tracking script on your test page. While the Control Script goes at the top of the page, the Tracking Script should go at the bottom, right before the tag. Ideally it should be the last thing in your HTML document. Just like before, right click or command click (for Mac) on the text area and copy the contents. The Page Section Script lets you break your webpage into different parts (like headline, image, description) so that you test different variations. The next part will entirely depend on how many sections you wish to test. To keep things simple we are only going to cover our headline, however, if you wish to change other areas the exact same principle will apply. Right click or command click (for Mac) on the text box area with the code. Generally a website's page heading should be a heading tag. In this case we are using the tag as our test heading. We paste what we copied from the Page Sections text box, however we want to make a minor change to the script where it says "Insert your section name here." Here you can name the section. You'll want to make this a meaningful name so you'll be able to recognize it later on. In this instance we are giving this section the name "Page h1 Heading." Again this is all on our "donate.html" test page. Note we named our section "Page h1 heading". You can give your section any name you like. Just make sure it's meaningful to you. Once we have finished here, we can save this webpage and move onto our thank you page. The final script counts the number of conversions your page received and which variation the visitor saw before they converted. It needs to be installed on our thank you (conversion) page. On our website this is the "thanks-for-your-donation.html" page. Right click or command click (for Mac) on the text box area with the conversion script code. In your thank you page, locate the tag and paste in the code. Now that you have placed the correct scripts in the right places, you will need to validate your script to ensure it's error free and ready to start running. If some of your pages are behind secure login pages or a secure page that is not publicly accessible, you will need to use the offline validation service. If all went well you should see the following screen. Once you are ready click Continue. With all the snippets installed, you're now ready to create your variations and launch your experiment. In Part 5 of the series, we'll show you how to do just that. If you can't wait, you can read ahead in the Website Optimiser Help Centre. Following up from our last post and introduction to Google Website Optimiser, we will now go through the process of how to install it on a website.